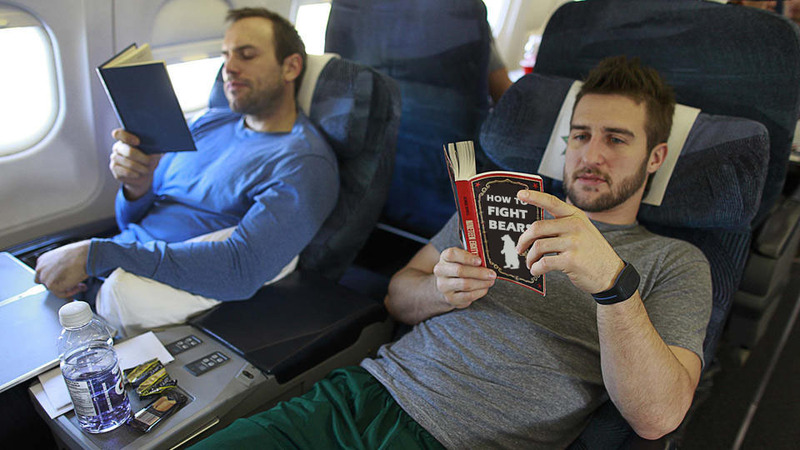 Tanner Glass, doing valuable research like a good Dartmouth alum. Last night, Tanner Glass knocked out Islander forward Matt Martin with a brutal haymaker. It was an impressive punch, and perhaps even moreso for Canuck fans, who are used to Glass holding his own in fights, but rarely winning them outright. According to HockeyFights.com, Glass has fought twenty-five times in a Canucks uniform and seven times this season. Do you remember any of them? Not really. But you'll remember last night's, and so will Matt Martin. Editor's note necessitated by hilariously false reports: the header image is also a photoshop. In the original image, Tanner Glass is reading George Orwell's 1984. As far as PITB knows, he has never read a book called "How To Fight Bears." Well done Harrison! Wahaha! Love the PS skills! 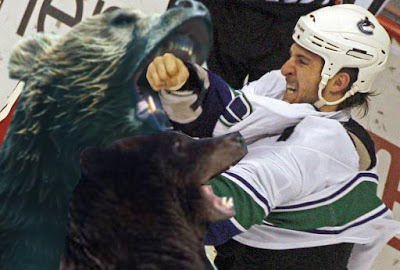 "How to Fight Bears"? What the...? In the third picture, it looks as if Glass has reached into the Bear's chest and crushed it's heart. Such ruthlessness. holy cow this is awesome!!!! you should photoshop a thumbs up on the 3rd photo. Like oh yeah? 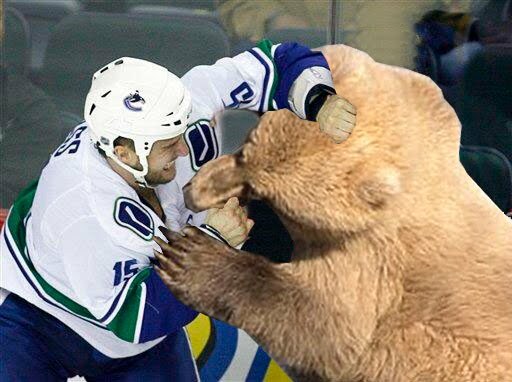 I'm Canadian i fight bears Thumbs up eh! Damn right, Ben. 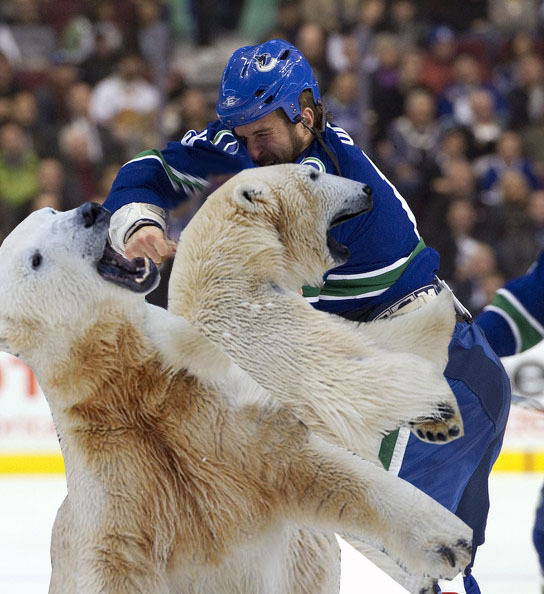 Polar bears and brown bears don't live anywhere near each other. If there's one thing I stand for, it's realism. I am saving these all... for research, of course. That second-to-last one is a thing of absolute beauty. The thumbs up would be funny if it was Desbiens, cause he doesn't know how to make a fist. Geez...and all this time I thought it was only wolverines and dingo's he trained against. New respect for Glass! And now seeing the source image -- didn't Tanner Glass go to high school before attending Dartmouth? Incredibly, I'm zeroing in on my Master's in English and I've still never read any Orwell. It's my secret shame. You should be very ashamed. "1984" is fantastic. But I didn't read it in high school either. So much funny in one post shouldn't be legal. 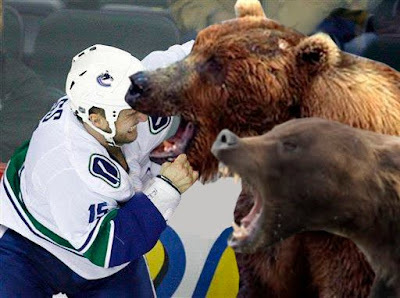 I think the kind of lip pulling going on in that fourth photo shouldn't be allowed in bear fights. Excellent work again, as is to be expected at PITB. Not to hijack a thread but Orwell is best read outside of high school. Actually, I remember him making very quick work of Luke Schenn early last season. That was a good one. 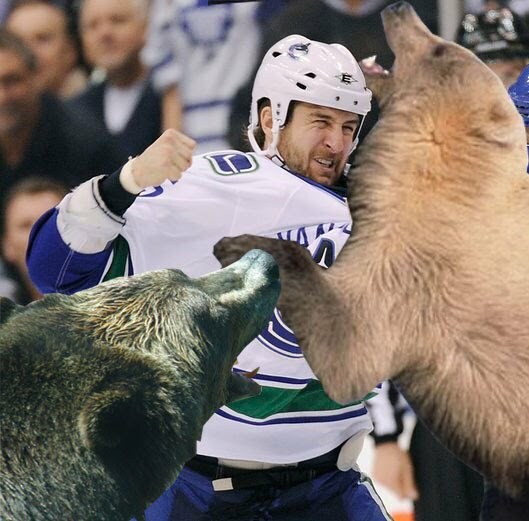 I hope there were "3rd Bear in" penalties assessed! harrison, read this and you've read eric arthur blair. Tanner could teach Colbert a thing or two. He could be re-reading it. Shirokov's Playing, So Who Sits? Random Oddity: Alex Edler has Taken 2 Faceoffs?